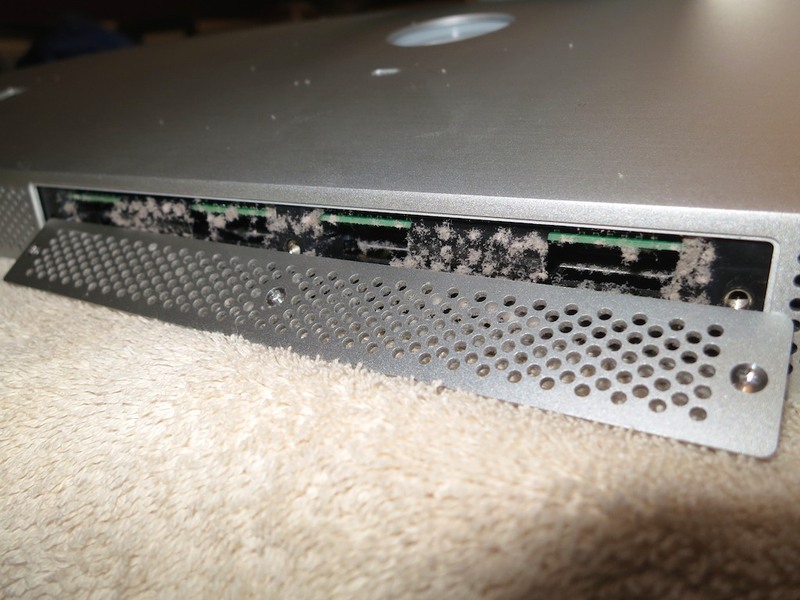 As you consider your New Year’s resolutions, don’t forget about the health of your computer. It might need a little more memory and a lot less dust! My iMac has been acting somewhat sluggish lately… lots of spinning beach ball action. I first thought it was simply because I had so many family photos jamming up my Aperture photo management software. But I eventually realized there might be more afoot than a memory-hogging program. My iMac hadn’t been to the Genius Bar at the Apple Store for a long while. Why not start off the New Year right on solid digital footing? Fast forward to my Genius Bar appointment, which I had easily booked online. My designated Genius ran a few diagnostics on my iMac, and within twenty minutes she gave it a clean bill of health. I asked her if installing more RAM might help my digital companion reclaim some of its original pep. My Genius looked a bit skeptical and said that 4GB should be enough to run memory-intensive programs like Aperture, but she decided to bring in a second opinion to confirm her perspective. My iMac has 4 RAM slots. Two of them contain 2GB RAM chips, and the other two of the slots are empty. Genius #2 suggested putting in four 4GB chips for a total of 16GB. It’s common knowledge you can buy RAM memory elsewhere for less and install it yourself, but I wasn’t feeling especially adventurous. I was willing to pay a premium for a little official Apple love. But the gesture wasn’t returned… this Apple store didn’t stock this older RAM. The name of this website he called up is actually Other World Computing, or ‘OWC,’ for those in the know. I could pick up the 16GB of RAM I needed for a great price…$199. So I boxed up my massive iMac and schlepped it back to my car. And in fact it did. But the pricing wasn’t quite as competitive as OWC…. I picked up two chips of 4GB RAM for $150. That would bring my computer up to 12GB of RAM. Not quite the recommendation of 16GB, but I figured I could always upgrade the other two slots later if I really needed to. Everyone I talked with… from Genius #2 to the helpful sales lady at the third-party store assured me it was super simple to install the RAM chips on my own. I’ve actually done this kind of operation a couple times before on non-Mac machines, and it always made me feel a little queasy jamming a delicate memory chip into a computer slot without breaking something. I place my heavy iMac face down onto a towel on my dining room table. 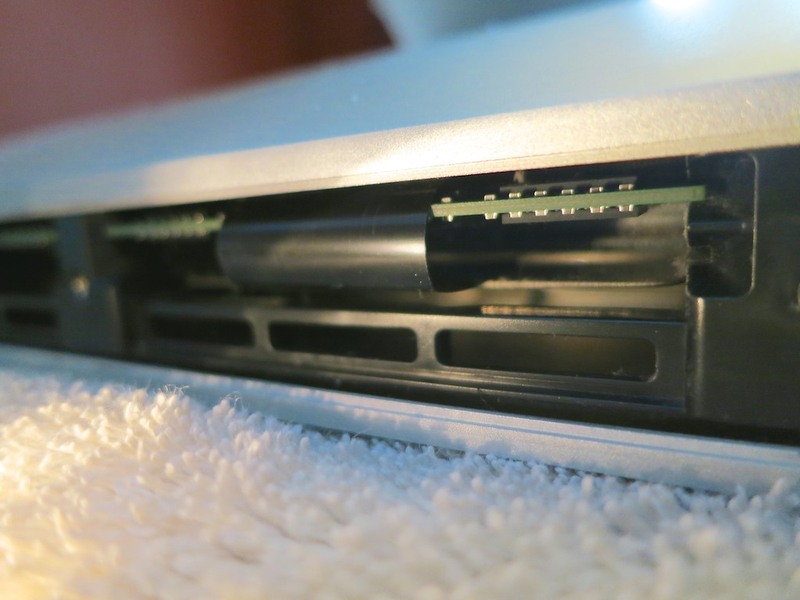 Under the bottom edge of the screen were three tiny Philips head screws, which housed a metal cover protecting the four RAM slots. There were these ‘mini-mountains’ of upside-down dust piles on the bottom edges of the two existing RAM chips. I didn’t have a can of air to blast the dust away. So I carefully removed the dust with a tiny, soft brush. As a result, a few clumps of dust fell into the side of the machine, just out of finger’s reach… but I carefully removed these powdery bandits with tweezers. 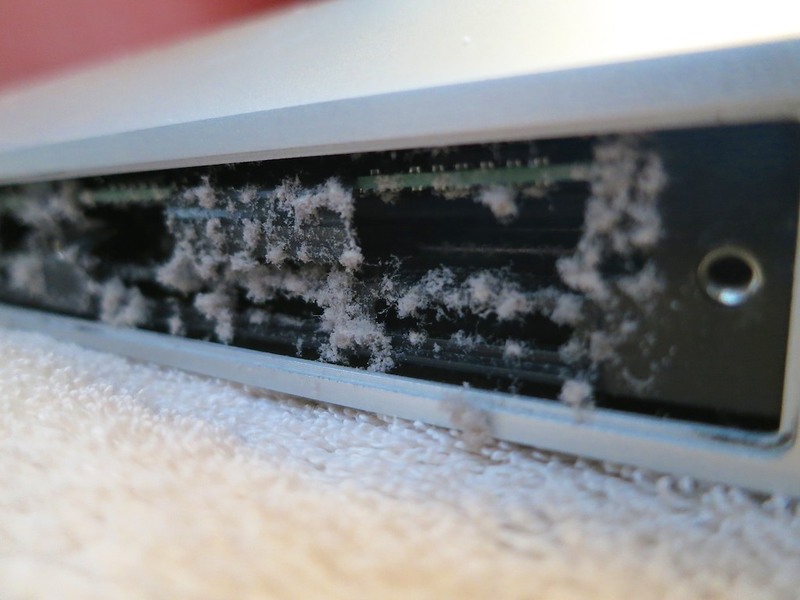 I wouldn’t exactly call my cleaning an exact science or a perfect execution, but at least there was a whole lot less dust hanging around to clog up my computer’s airflow. Now, it was finally time to insert my new RAM. Yes, it was indeed a pretty straightforward process… you lift out two flexible, plastic tabs that are blocking your way… and then you insert your RAM with increasing effort until you feel that horrible scrunching sound of two plastic parts being forced to bond together. You hope you haven’t done any damage; you screw the bottom plate back on… and you lug your iMac back to its normal location and plug it in. I immediately checked to see if the new RAM memory registered. I opened up Aperture and happily saw an immediate improvement. My computer was indeed much more snappy! So as you consider your New Year’s resolutions, you might want to make sure you’re not waiting around for your computer to keep up with the “new you” this year. Everybody and everything needs a little boost… every so often.